Community Q&A Question: ANY GAINS?? I currently have A explorer intake on my 90lx will the SVE intake flow the same or will this be an upgrade from that? And will the TB & spacer make the same annoying whistle as the BBK setup i have now? 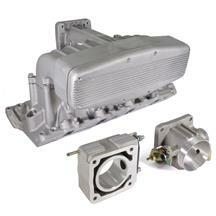 The intake you are currently running is similar to a GT40 or 93 Cobra intake, and this will flow better than those. We have not encountered any whistle issues with these. You should be good to go.